Home / News/ MR says Jana Satana against “vengeful” Govt. MR says Jana Satana against “vengeful” Govt. Commencing the much-awaited Joint Opposition ‘Jana Satana Paada Yathrawa’ yesterday, its leader former President Mahinda Rajapaksa claimed the march was against the ‘vengeful Government’ that was trying to take revenge from heads of the prior Government as well as the innocent public. Rajapaksa made the observation after paying homage at Gatambe temple on Thursday morning before the beginning of the Paada Yathrawa. “The United National Party (UNP) led Government is attempting to politically witch-hunt Joint Opposition members to satisfy their hunger for revenge. However now it has turned into victimising the people who voted for the Sri Lanka Freedom Party (SLFP) at the last election,” he told the large gathering. Rajapaksa further claimed suppression of the Opposition had not occurred under his regime or former President Chandrika Bandaranaike Kumaratunga’s Government and emphasised that the Joint Opposition had a right to protest against the Government. “The Government knows that it has acted beyond the ‘Good Governance’ policies it promised the people at the last election. It knows it is unpopular. That was why it sought Court orders to disrupt our march,” he stated. Rajapaksa added the Joint Opposition struggle was to urge the Government to correct itself. 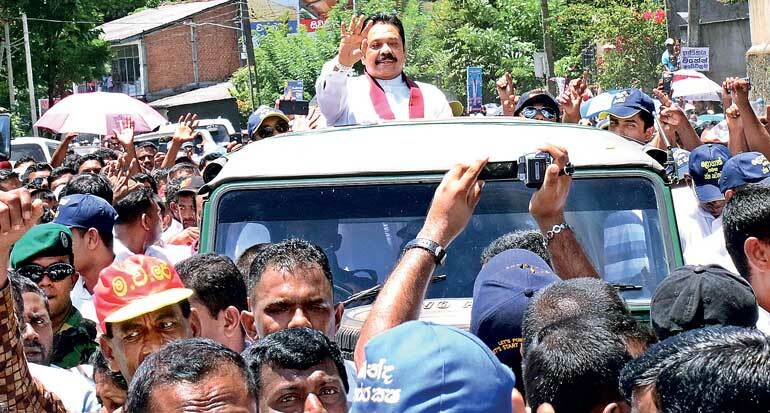 Commenting on the Mawanella Magistrate’s order to use alternative routes to bypass Mawanella town today, where the march was planned to start on its second day, Rajapaksa stressed they would definitely obey the Court order, but the Paada Yathra would reach Colombo on 1 August as pledged. Following the Kandy Magistrate Court order issued Wednesday not to commence the march within the Kandy town limits, it began from Peradeniya junction on Thursday morning with crowds reaching from Peradeniya junction to Kiribathkumbura junction. Meanwhile, most of Sri Lanka Freedom Party (SLFP) MPs who are well-known Rajapaksa supporters including Dullas Alahapperuma, Kumara Welgama, Bandula Gunawardena, Rohitha Abeygunawardena, Mahindananda Aluthgamamage, Namal Rajapaksa, Johnston Fernando, Pavithra Wanniarachchi, Prasanna Ranatunga, Keheliya Rambukwella, Lohan Ratwatte, Dilum Amunugama and Mahinda Yapa Abeywardane were seen at the Paada Yathrawa despite party objections on participation. Senior SLFPers Rajapaksa’s elder brother former Speaker Chamal Rajapaksa and Prof.G.L. Peiris also joined the march. Protesters shouted slogans against Government moves to postpone Local Government polls, increase the tax burden, curtail fertiliser subsidies, sign the Indo-Sri Lanka Economic and Technology Cooperative Agreement (ETCA) and arrest politicians of the former Government. The route from Peradeniya to Ganetenna was completely blocked due to the march causing heavy traffic. There were a number of ambulances between the blocked vehicle lines as well. The Joint Opposition alleged the ambulances were not driven for genuine purposes but was a Government conspiracy to spread the wrong image about the march among people. The Paada Yathrawa ended in Ganetenna town for its first day and will start near Mawanella town limits on Friday morning. It expects to reach Nelumdeniya by this afternoon.